Our DivvyHQ team is based in Kansas City, and if there’s one thing every outsider knows about KC, it’s that we bring it with the BBQ. My hometown boasts more than 100 barbecue joints, including some of the country’s very best. When it comes to eating, we have a vast number of delicious options at our (sauce-stained) fingertips, so we’re always keeping an eye out for “Best Of” lists where readers choose their favorite spots. We Kansas Citians are sophisticated in our BBQ palettes, you see, and our standards have grown impeccably high. When an establishment is selected by locals as the best of KC barbecue, you know that place is getting it right. We feel the same way about the 2018 fan favorites for content tools selected by Content Marketing Institute’s community. You won’t find a collection of people with more passion and knowledge around all things content, so CMI’s audience research holds a great deal of sway in our world. 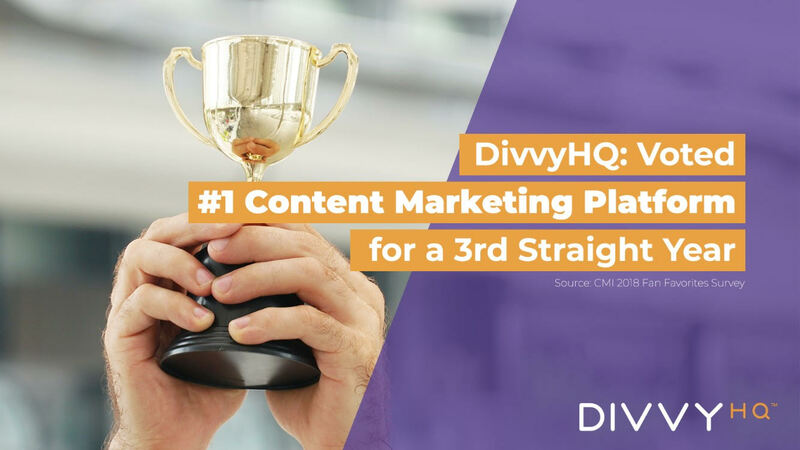 For a third straight year, CMI’s community has chosen DivvyHQ as the industry favorite Content Marketing Platform! According to CMI, DivvyHQ was the top pick on 20% of all surveys. We are beyond grateful for the honor, and will keep working our hardest to continually earn your esteem. In addition to the nod as best content marketing platform, we are also thrilled to have placed among the top five (alongside some humbling company) in these other categories: Marketing Analytics, Project Management and Team Collaboration. We wanted to take this opportunity to shout-out some other content marketing tools being rightfully recognized for their excellence. First and foremost, big ups to our pals at Concured and SDL for reaching the top five in “AI for Content Marketing” and “Translation Services,” respectively. We at Divvy are proud to partner with both of these innovative brands in our shared mission to simplify life for content teams. It comes as no surprise Google Analytics was a runaway No. 1 choice in the category of Digital Analytics. The tool has become indispensable for results-focused marketers everywhere. Google does an amazing job of making the complex and dense information housed in GA accessible, understandable and actionable – even for a numbers-challenged writer like myself. But despite its undeniable usefulness, Google Analytics doesn’t cover everyone’s needs on its own. Other top finishers include Moz, Kissmetrics, Adobe Analytics and IBM Digital Analytics. Each brings distinct strengths to the table. At DivvyHQ, our content analytics feature pulls data from more than 150 sources into one platform. That convenience helped push Divvy to the top five for Marketing Analytics along with heavy-hitters such as Google, BrightFunnel, Mixpanel and LinkedIn Website Demographics. Again: fantastic company. On large and busy teams, the job of a content marketing manager can often overlap with that of a project manager, so it’s crucial to have software that helps us organize tasks, track timelines, and allocate resources. The people’s choice for best dedicated solution in this category was Asana, a product that many have complimented for its sleek interface and ease of use. Also gaining recognition were Trello, Basecamp, Microsoft Project, and — yes — DivvyHQ. We often describe our platform as a “project manager in a box” tailored to content teams, and it’s great to hear folks are using it as such. We’ve said it before and we’ll say it again: content collaboration should be a top priority for teams everywhere. This element is fundamental to Divvy’s functionality, so we were ecstatic to be mentioned in the vicinity of leading business collaboration tools such as Slack, Trello, Confluence and Evernote. One of the key digital marketing trends we’ve noticed is a widespread focus on upping the ante with social media measurement. Companies are no longer satisfied with superficial “reach” metrics and want to get a better look at conversions, targeted engagement, and business impact. Kudos to the trailblazers picked in this category — HootSuite, BuzzSumo, Sprout Social, TrackMaven and Salesforce Social Studio — for helping to raise the bar. Congrats to All Content Marketing Tools Recognized! It’s an awesome time to be working in the fields of content planning, creation, and distribution. We are lucky to have so many stellar content marketing tools and technologies available to us, many of which are showcased on CMI’s list. Thanks to all of these companies helping propel the discipline forward. Thanks to Content Marketing Institute for putting together this annual research. And above all, thanks to our customers and supporters for showing so much love. If you want to find out why DivvyHQ is a favorite of top content marketing pros, request a demo and we’ll show you all it can do. Or, if you’re not quite ready, scroll down and subscribe to our newsletter for advice and insights you can use. Brock is a brand builder, technology entrepreneur, and Co-Founder of DivvyHQ. He has a unique mix of creativity and business acumen, which has helped him build and lead dynamic teams and successful businesses. In 2005, he founded a trailblazing content marketing and website development agency. During that time he worked with over 150 companies. His goal is to help organizations elevate their brand reputation and help them connect, excite and engage with their consumers in innovative ways.